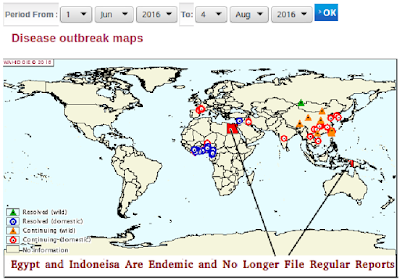 Up until a couple of years ago - except in the world's most endemic H5N1 regions (Egypt, Indonesia & Vietnam) - the Northern Hemisphere's summer months were relatively devoid of avian flu reports around the globe. Most years June and July looked pretty much like the OIE avian flu activity map below, from 2013. This quiescent summertime pattern began to change in 2014 after the emergence of several new HPAI H5 viruses (H5N8, H5N2, H5N6) - along with LPAI H7N9 - in Asia, and summer bird flu activity has been on the ascendant since that time. Suddenly our venerable, solitary HPAI H5N1 bird flu threat - which quite frankly, had been on the decline around the world for several years - not only had serious competition, it was experiencing a bit of a renaissance itself. 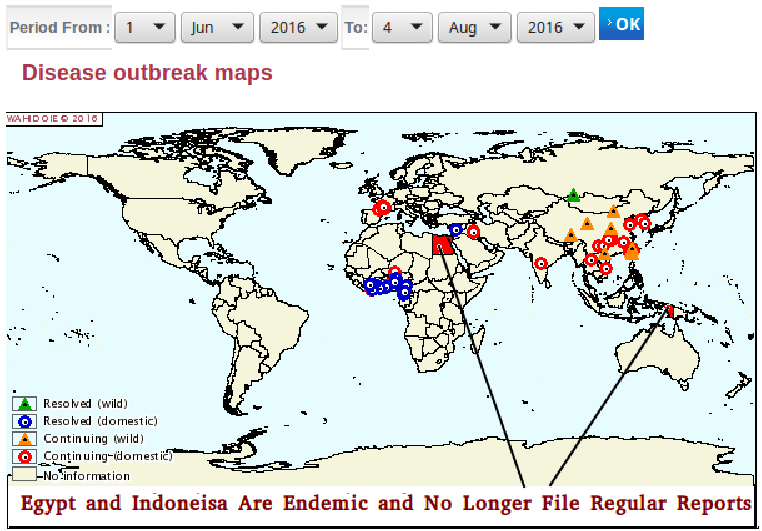 In 2014, H5N1 picked up several key mutations in Egypt (see Eurosurveillance: Emergence Of A Novel Cluster of H5N1 Clade 2.2.1.2) which appear to have increased its transmissibility from poultry to humans, sparking the biggest human outbreak on record (see EID Dispatch: Increased Number Of Human H5N1 Infection – Egypt, 2014-15). H5N1 also returned to West Central Africa in 2014, and has become well entrenched, after an absence of 5 years (see EID Journal: HPAI A(H5N1) clade 2.3.2.1c In West Africa). And in 2015, in Novel H5N1 Reassortment Detected In Migratory Birds – China, we looked at the emergence and spread of clade 2.3.2.1c and made special note of its apparent neurotropic qualities. This summer, in addition to H5N1's regular haunts of Egypt & China, we are seeing reports of large outbreaks in Iraq - the first time we've seen confirmed reports out of that nation in a decade. H5N1 has become so well entrenched in Western Africa (Cameroon, Burkina Faso, Cote d'Ivoire, Ghana, Niger and Nigeria) that last month we saw another concerned FAO Call For Increased Vigilance On H5N1 In Africa. 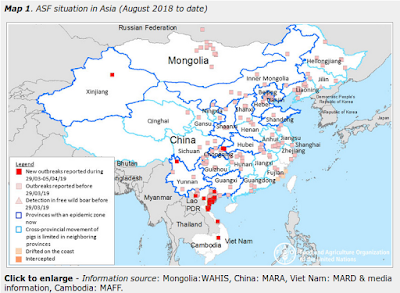 H7N9 has shown unusual persistence during this summer as well, infecting at least 12 people over the past two months in China - more than were reported during the previous three summers combined. 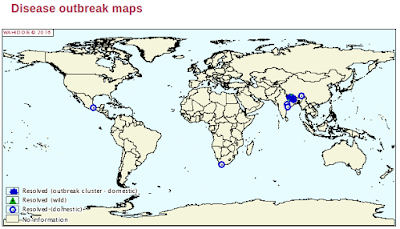 H5N8, H5N2 and H5N6 continue to affect poultry holding across Asia, and while we haven't seen a human H5N6 infection since May 28th, reporting and surveillance out of China isn't always as prompt or complete as we'd like. France is still dealing with their unprecedented HPAI/LPAI H5 epizootic, which as of a week ago had affected 81 poultry holdings since last November. There are other, less concerning outbreaks this summer as well; LPAI in Ontario, South Africa, and Denmark. Human H9N2 infections in China and Egypt, HPAI H5 In Wild Birds - Russia . . . the list goes on. While we haven't had any disastrous outbreaks, it's been an atypically busy bird flu summer. Of course, we only see the tip of the iceberg. For much of the world, avian flu surveillance is all but non-existent. And the same goes for testing, and reporting, of human infections. While it is tempting to try to connect our busier-than-average bird flu summer to some kind of increased threat this fall and winter - we saw a similar pattern last summer - and not only did avian flu fail to return to North America and Europe last winter, we saw one of the lightest North American flu seasons in years. Until we get a lot smarter figuring out what these viruses will do in the future, we'll have to be content with tracking them (as best we can) in real time, while remaining alert to any changes in their behavior.